Officials say the new digital information display and complimentary Wi-Fi on the museum's entrance level keeps the museum moving forward. 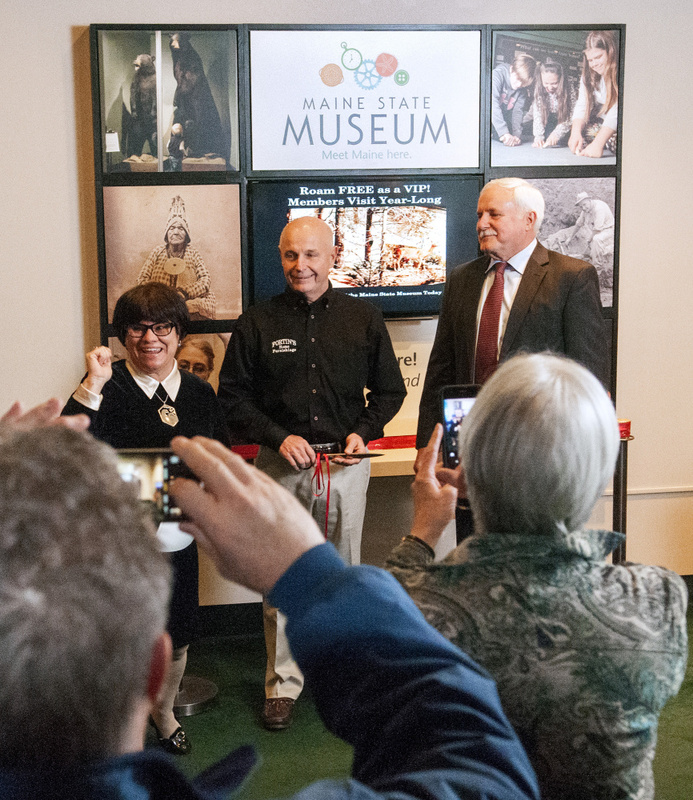 AUGUSTA — Maine State Museum officials and business leaders unveiled upgrades to the visitor experience with an eye to the future during a ceremony Thursday morning. The upgrades include a new digital information and photo display in the museum’s welcome area and complimentary Wi-Fi on the museum’s entrance-level exhibit areas. Jon Doyle, chairman of the Maine State Museum Commission, said the museum is beloved by everyone and these improvements, spearheaded by FairPoint Communications’ Maine leadership, will ensure that continues. FairPoint, a North Carolina-based company that was acquired Monday by Consolidated Communications for $1.5 billion, provided the funding for the museum’s new third-floor Wi-Fi network. Jennifer Dube, the development director for the Friends of the Maine State Museum, said the project was a collaboration among many people and businesses and took about six months of planning. The digital display features six photographs bordering a 40-inch Sony Smart TV and a panel featuring the museum’s logo and tag line. The display, which allows different photos to be shown, showed six different images taken at various spots within the museum. The smart TV, donated by Fortin Home Furnishings in Winslow, includes a rotating slide show with museum information, exhibits and artifacts and programs. It can also play videos that highlight specific programs and activities, such as carving arrowheads, which is one of the museum’s most popular programs. “We have a wonderful new digital tool where we can showcase museum collections, events and philanthropy,” Dube said. The display also has donation envelopes and a slot connected to a lock box for people who want to contribute to the museum. 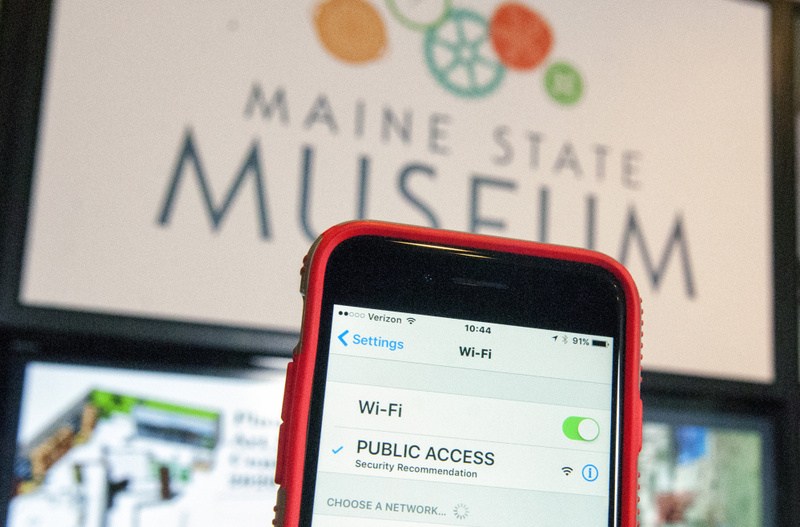 The museum already has Wi-Fi on the fourth floor in the temporary exhibit space, which currently houses an exhibit on Maine’s gunsmiths. Chief Educator Joanna Turow said the new display and Wi-Fi connection will help expand the museum’s program offerings and what children and adults can do while visiting the museum. The Maine State Library, a floor below the museum, has a Wi-Fi network that works sporadically outside of the library on the entry level. Museum officials said many people have asked about Wi-Fi access in more places throughout the museum. They said they hope one day the entire museum will have Wi-Fi coverage. Dube said museum officials spend time talking about staying relevant in the 21st century, and these new improvements go a long way to making sure the museum continues to move forward. The museum now has two focal points in its welcome area — the digital display and the historic Lion steam locomotive, which was built in 1846 and was added to the National Register of Historic Places in 1976. The musuem, at 230 State St., is open from 9 a.m. to 5 p.m. Tuesday through Friday and from 10 a.m. to 4 p.m. Saturday.